I noticed that the Diagnostic and Statistical Manual of Mental Disorders (DSM-5, the handbook for mental health experts), now recognizes hoarding as a specific disorder. I suppose that’s a step in the right direction. I mean, any “just let go of your stuff” ideal is just another dead-end of the free will fantasy. Life is moved to ‘grab on’, whether it be a bacteria, an ant, or a human. It appears that we’re the only species taking this instinct far enough to make it a disorder. Knowing why may offer some chance to alleviate this effectively…. right? All the historical and archeological evidence suggests that the obsessive characteristics of this instinct followed the advent of a settled civilized life-style made possible by the Agricultural Revolution. Staying put allowed us to circle-the-wagons and accumulate. Since then we have run the gamut of “just let go” narratives in a quest to rebalance ourselves spiritually. Alas, history also shows how ineffective that’s been. Yet, in ignorance, we convince ourselves that it will work next time if we just try harder. From a symptoms point of view, such idealism shows how far out on our evolutionary limb we’ve ventured, and rebalancing isn’t a simple matter of ‘just doing it’. Buddha’s 2nd Noble Truth addresses the source of this hoarding disorder of ours most succinctly: “The surrounding world affects sensation and begets a craving thirst that clamors for immediate satisfaction. The illusion of self originates and manifests itself in a cleaving to things. The desire to live for the enjoyment of self entangles us in a net of sorrows. Pleasures are the bait and the result is pain”. Importantly, settling down allowed humans to cleave to things without the natural limitations that keep other animals in the wild balanced. Note the underlined point above. It tells me that “letting go” of what we cleave to is tantamount to committing some degree of ego suicide. What is ego, other than the illusion of self. 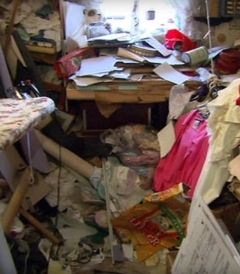 A hoarder’s cleaving is obvious from all the clutter. However, cleaving applies to everything possible to grasp, whether physical, emotional, or mental. It is like that old saying; you are what you eat. Likewise, “I am” the cultural baggage “I cleave to“. Any resulting suffering is the price “I” pay. The only way to avoid paying that price is through the death of ego, or to put this more pleasantly, profound humility! We all support that, don’t we? Alas, only maturity can truly bring that about. There’s no way to freely choose to be humble. Although knowing why may help somewhat or at least point us in the direction of the sanity we seek… right? They say ignorance is bliss, and I can see their point. However, when I look back on the extensive ignorance of my youth, I don’t recall feelings of enhanced bliss! If anything, it’s just the opposite. Now, would the natural cognitive ignorance experienced by animals (besides human) be more blissful? I’d say so, given that desire = thought + need and worry = thought + fear. (See Fear & Need Born in Nothing.) In addition, they don’t suffer the disease of thinking they know. (See Realizing I don’t’ know is better; not knowing this knowing is disease.) In any case, who would have thought that hoarding and ego were so entwined? This reference to Shakespeare implies that the names of things do not affect what they really are. The links below are other renditions of the 2nd noble truth. They illustrate for me how more words tend to obfuscate the essence. Aren’t we who write just attempting to convince ourselves? 😉 You could say we’re all just beating around the bush, with this experience promising the ‘smell’ we seek. My own experience may be instructive. I’ve been reciting the short version of Buddha’s Four Noble Truths daily for decades. A while back the line, The illusion of self originates and manifests itself in a cleaving to things suddenly delivered the ‘smell’ I had unknowingly sought. During all those previous decades, that line was merely a ‘Truth’. Perhaps this experience cleared my senses to a sweet-smelling realization that soon followed… We only understand what we know. Life seems to be a process of wandering around waiting for lightening to strike. It certainly is an adventure, isn’t it? Links to other renditions of Buddha’s 2nd truth.